Weiner is a 2016 American fly on the wall political documentary film by Josh Kriegman and Elyse Steinberg about Anthony Weiner’s campaign for Mayor of New York City during the 2013 mayoral election. The documentary follows congressman Anthony Weiner and his wife Huma Abedin, shortly after his 2011 resignation when scandalous photos of Weiner mysteriously appeared on his Twitter account, leading to a tumultuous spiral as more and more pictures of the congressman in various states of undress begin to leak to the public. The documentary revolves around his attempted comeback from his initial resignation during his 2013 campaign in the Democratic Party primary for Mayor of New York City. His campaign goes well at first, with many New Yorkers willing to give him a second chance as evidenced in polls putting him at or near the top of a tight mayoral race. During the filming of the documentary, however, additional photos and evidence of online sexual activity surface, including explicit text conversations with women that occurred well after his 2011 resignation from Congress. The mood of the campaign switches from exuberance to pain. Intimate views are captured of Weiner, his wife and his campaign staff struggling with the new revelations and the media firestorm that ensues. Weiner's wife, an adviser to Hillary Clinton, comes under fire during the scandal. The relationship between the couple gets strenuous, and in a couple of instances, the camera is asked to leave the room. Weiner's campaign manager quits when a press conference is held in which Weiner comes clean of his sexting, and his campaign begins to take a downward spiral. Weiner comes in fifth place in the polls, garnering only 4.9% of the popular vote. The film premiered at the Sundance Film Festival in January 2016. It was released theatrically in the United States in May 2016 and broadcast on Showtime in October 2016. Starting June 2014, the film began releasing internationally in the UK, Netherlands, Scandinavia, Australia, and Japan, and television broadcasts in Spain, Italy, France, Germany, Israel, Belgium, and Holland.. The film received an R rating from the MPAA for language and some sexual material. Upon release, Anthony Weiner declined to endorse the film and claimed he had no intention of ever seeing the final product, saying "I already know how it ends." After the film was released, Weiner claimed that "Kriegman had assured him verbally and in emails that he would not use Abedin in the film without her consent", and that Abedin never granted permission for Kriegman to use the footage. When asked if he will sue the filmmakers, Weiner didn't give a definitive answer. The filmmakers disputed Weiner's claim, stating that they clearly "had consent from everyone who appears in the film, including Anthony and Huma." The film received near universal acclaim by critics. Review aggregator website Rotten Tomatoes gives it a 96% approval rating based on 160 reviews, with an average rating of 8.2/10. The website's critical consensus reads, "Weiner uses sharp insight and untrammeled access to offer a portrait of a political and personal collapse that's as queasy as it is undeniably compelling." On Metacritic, the film has a weighted average score of 84 out of 100, based on 33 critics, indicating "universal acclaim". ^ "WEINER (15)". British Board of Film Classification. June 8, 2016. Retrieved June 8, 2016. ^ "Weiner (2016)". The Numbers. Nash Information Services. Retrieved September 3, 2016. ^ Kohn, Eric (January 24, 2016). "Sundance Review: 'Weiner' is the Best Documentary About a Political Campaign Ever Made". IndieWire. Penske Business Media. Retrieved August 22, 2018. ^ Bakare, Lanre (January 24, 2016). 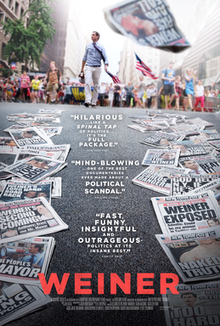 "Weiner review: an unsparing portrait of politics". The Guardian. Guardian News and Media. Retrieved August 20, 2018. .
^ Leibovich, Mark (August 18, 2016). "Anthony Weiner Says His Wife Never Agreed to That Documentary". The New York Times. The New York Times Company. Retrieved August 20, 2018. ^ "Weiner (2016)". Rotten Tomatoes. Fandango Media. Retrieved August 28, 2018. ^ "Weiner Reviews". Metacritic. CBS Interactive. Retrieved February 14, 2018. ^ Willmore, Alison (December 9, 2016). "Here Are The 11 Best Movies Of 2016". BuzzFeed. Retrieved February 15, 2017. ^ Schager, Nick (December 20, 2016). "The 10 Best Documentaries of 2016 That Are Trying to Change the World". Esquire. Hearst Communications. Retrieved February 15, 2017. ^ THR Staff. "Critics' Picks: The 10 Best Documentaries of the Year". The Hollywood Reporter. Prometheus Global Media. Retrieved February 15, 2017. ^ Jacobs, Matthew (December 15, 2016). "The 21 Best Movies Of 2016". HuffPost. Oath. Retrieved February 15, 2017. ^ Kohn, Eric (December 5, 2016). "16 Best Movies of 2016". IndieWire. Penske Business Media. Retrieved February 15, 2017. ^ The Editors of GQ (December 19, 2016). "The Best Movies of 2016". GQ. Condé Nast. Retrieved February 15, 2017. ^ Schonfeld, Zach; Firger, Jessica; Goodman, Leah Mcgrath; Raeburn, Paul; Westcott, Lucy; Noriega, Margarita; Toureille, Claire; Nazaryan, Alexander; Saville, Jordan; Burleigh, Nina; Roe, Bob; Walters, John (December 15, 2016). "The 21 best movies of 2016". Newsweek. Retrieved February 15, 2017. ^ Campbell, Christopher (January 8, 2017). "The Best Documentaries of 2016, Ranked". Thrillist. Group Nine Media. Retrieved February 15, 2017. ^ Freeman, Peter (December 31, 2016). "DC Outlook's Top 10 Movies of 2016". DC Outlook. Retrieved August 20, 2018. ^ "The 2017 AFCA Awards". Australian Film Critics Association. Archived from the original on March 13, 2018. Retrieved February 28, 2018.